In 1850, a screw-pile lighthouse was built upon Brandywine Shoal, and its initial success encouraged the Lighthouse Board to try it again at Cross Ledge. The project was begun in 1855, but ice flows during the winter of 1856 destroyed the work and caused the board to reconsider the wisdom of erecting screw pile lighthouses in so northerly a location. A lightship (Upper Middle Lightship) was placed on the site until Cross Ledge was completed in 1875. 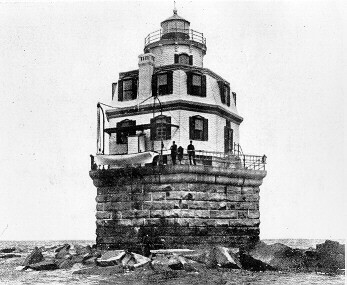 The new lighthouse was described as a black lantern on a white two-story wood framed structure, with lead colored trimmings, green shutters, and a mansard roof. The lighthouse was built atop a granite pier. 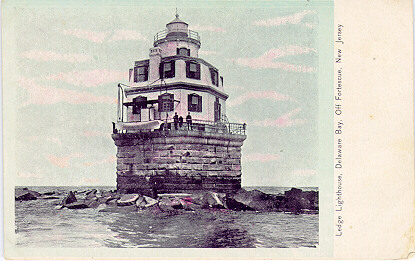 Due to deteriorating condition of the foundation and the erection of the nearby Elbow of Cross Ledge Lighthouse, Cross Ledge was decommissioned in 1907. Today only the granite foundation remains. It is known to locals as "the rock pile."